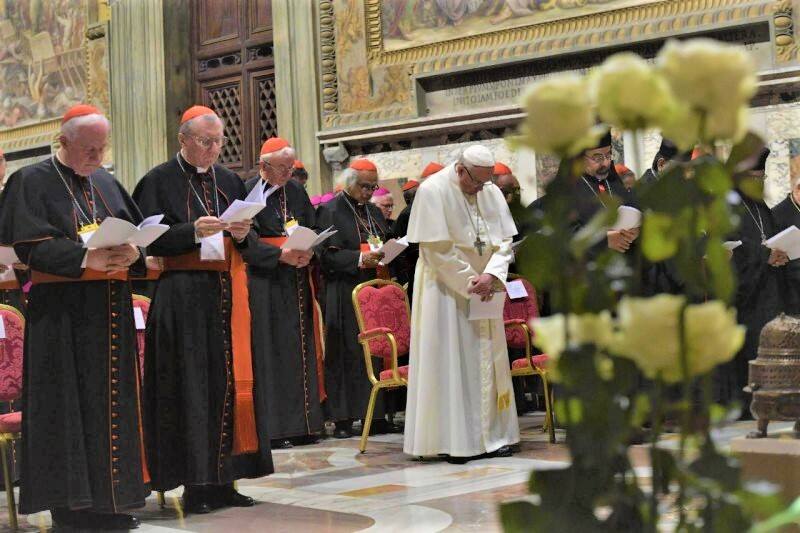 On Day 3 of the "Protection of Minors" Meeting, church leaders examined their consciences and confessed their sins during a penitential service at the Vatican. “We confess that bishops priests, deacons, and religious in the Church have done violence to children and youth… that we have shielded the guilty… that we have not acknowledged the suffering of many victims… that we bishops did not live up to our responsibilities”. The collective confession of faults by Pope Francis and almost two hundred Cardinals, Bishops, and other church leaders, was perhaps the most striking portion of the Penitential Service that marked the end of the final working day of the Meeting for the Protection of Minors in the Church. “Lord Jesus Christ”, they prayed, “we ask for your mercy on us sinners. Kyrie eleison”. Lord, have mercy. The Service began with a hymn of penance, and penitential psalm, followed by the reading of the Parable of the Prodigal Son, from the Gospel of St Luke. Following the Gospel reading, Archbishop Philip Naameh, of Tamale, Ghana, addressed the assembly, with a somber reflection. “Too often we have kept quiet, looked the other way, avoided conflicts – we were too smug to confront ourselves with the dark side of the Church. We have squandered the trust placed in us”.